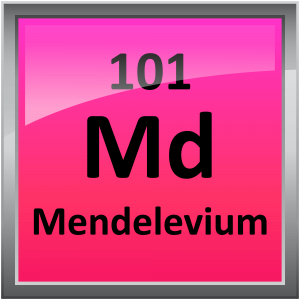 Mendelevium is a radioactive metal. Isotopes: Fourteen isotopes have been recognized. Properties: Mendelevium is the ninth transuranium element of the actinide series. Experiments indicate that mendelevium has a moderately stable dipositive (II) oxidation state in addition to the tripositive (III) oxidation state, as is characteristic of the actinide elements. Uses: Md-256 has been used to determine some of the chemical properties of mendelevium in aqueous solution. Sources: Mendelevium first was produced during the bombardment of Es-253 with helium ions in the Berkeley 60-inch cyclotron. The isotope produced was Md-256, with a half-life of 76 min. Md-256 was synthesized on a one-atom-at-a-time basis.